You will feel you are in Paradise when you watch the magnificent sunsets from a lovely contemporary home overlooking the Sacramento River. Enjoy a spectacular view of the city and the surrounding mountains and awake to the music of singing birds. An excellent place for bird watching. You are always made to feel "special" here. Travelers and business people alike seek out the comfort and relaxed atmosphere of Palisades Paradise, in a quiet, residential neighborhood. All rooms are centrally heated, air-conditioned and have cable television. Garden Spa! Small do in residence. You will find Palisades Paradise a serene setting for a quiet hideaway, yet conveniently located one mile from the Hilltop business/shopping area and Interstate 5. 2 Rooms $70-125 AE,V, MC Advanced reservations are recommended. Inspected and approved by ABBA and CABBI. Privacy Package Available @ $125. If you can find a place to stay with a better view of the River, your money will be Refunded! This and other Redding Bed and Breakfast Inns can be found here in The Register. 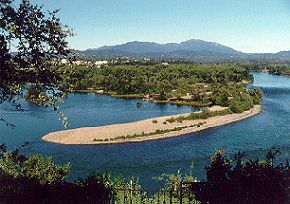 Romantic Country Inns, Getaways and B&Bs offer a great Sacramento River lodging alternative to big hotels.